I have always enjoyed stepping out of the box a little bit when it comes to my fashion. The key is that I am happy with my style, along with being comfortable and confident. It took me taking baby steps to really appreciate and learn to step out with CONFIDENCE when it comes to putting together my look. Now, I wouldn’t say I am extreme with my clothes , I do, however, enjoy putting a different spin on my style from time to time. And, I think the fact that I started off taking baby steps has allowed people to understand my creativity when it comes to my fashion. Being confident and creative has allowed me to try different types trends that are tasteful but understandably noticeable. My clients always tell me the one thing that they would like, is to step out of their basic look and transition into a new look that works for them, their body type and of course their personality. When I talk to them about this simple change, assuring my clients or blog followers that it’s not about changing them, it’s about changing the way they look at fashion. It is also about incorporating new changes to fit them, their personalities as well as their lifestyle with the idea of being comfortable with their new changes. Starting off small will open up many doors when it comes to a new transition. This will also allow them to enjoy the new trend that he or she has always wanted, but without the stress of trying to over do it. The key to trying new fashions are taking simple baby steps. Because let’s be real…Change can be hard. But, fashion can be a fun and simple change without the major stress. You can combine small prints into your accessories like a belt, purse, shoe, jewelry or scarves. When you start small this will allow you to adjust to the possibility of incorporating larger prints into your wardrobe. This is the same as prints. Keep your pops of color simple and work your way up to possibly mixing in those colors with your prints. A great tip I give my clients….Find a print on an article of clothing that you have hanging in your closet. Check out how the designer combined different colors in that print. This will allow you to get an idea of what colors you can mix together when it comes to mixing up your style. Small steps of color blocking can be very beneficial . Start with something solid and incorporate colored accessories here and there. yellow and yellow-orange; yellow and yellow-green; violet and blue-violet, etc. yellow and red-orange; blue and violet-red; green and orange, etc. yellow and violet; blue and orange; red and green, etc. Colors that form a T.
blue, orange, and violet-red; yellow, violet, and red-orange; yellow, blue-green, and red-orange, etc. blue, orange, violet-red, and yellow, violet, blue-green, and red-orange, etc. When it comes to mixing your prints and your colors I would research. Fashion magazines, fashion blogs, Pinterest, or ask someone that knows his or her fashion 411’s. Don’t give yourself just one style, try different types of fashions and accessories. See how easy it is to transition prints and colors into your simple style. Try these baby steps of changes . Don’t be afraid to step out of that fashion box. These are just a few simple changes that I know you can mix into your wardrobe. I totally agree with your clients! I would love to step out of my average look and find a new, fashionable look that fits me well. I always say if I had the money, I would do a total closet makeover. I’m trying to change things a little bit at a time as I find things at a bargain. Your color wheel is very helpful, by the way! Caitlin, it’s all about baby steps. No need to closet overhaul. Just add simple details to your style. Thanks for reading and if I can help with anything please feel free to let me know. God bless! 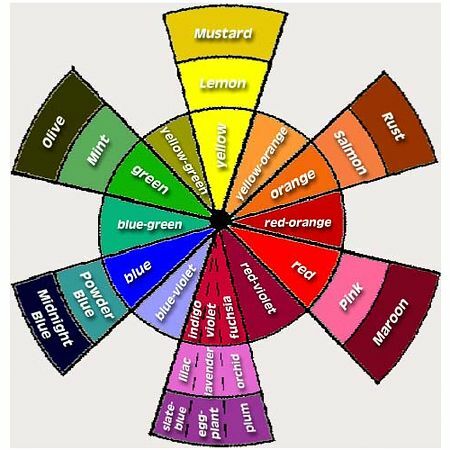 As Caitlin stated, your color wheel is helpful! And when I want to change up my style a little, I get my daughter, she’s 11, to help me out. Though I love fashion myself, you can also get a great look from listening to others….yes, even kids. She’s brutally honest with how I look wearing something and can tell me what works and what doesn’t…..I have my own little stylist at home! Lol! And the crazy thing is…..she hasn’t steered me wrong. Yes, but remember, teenage or young girls might be honest but are not tuned into an adults style. So what looks bad to them might not be the opinion you need. Kids style are a lot different these days.
? I know you look gorgeous.